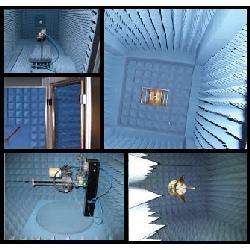 QuietBoxes were developed for testing hand held wireless devices such as computing, cellular and WiFi devices. 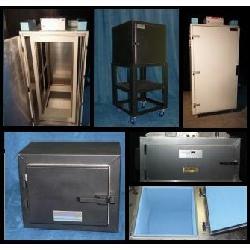 Their unique features of small size, ease of use and safety make them ideal enclosures for trouble shooting and Quality Assurance testing. When interfaced with test equipment, a QuietBox can become an important part of a fully automated QA testing system. A well designed QA testing system can be operated by assembly personnel, thus increasing the productivity of the EMC Technicians and Engineers. QuietBoxes typically provide 80 dB of RF shielding attentuation between 1 MHz and 10 GHz, however, higher levels of shielding are available on special order. Far field antenna measurements are performed in a reflection free and electromagnetically quiet environment. When there is no concern for radiated interference between the ambient and the measurement system, pre-compliance measurements can be made out doors or in a lab (some strategically placed absorber may be required). Otherwise, an Engineered RF Shielded Anechoic Chamber is required to provide a controlled environment for making accurate measurements. Raymond RF Measurements can provide a complete Engineered system or any of the required individual components.